Artists have a way of saying so much with so little (as the case actually is with a piece of art by Illma Gore, but we’ll get to that). Of course, that’s a misleading way to open this blog: presidential hopeful Donald Trump has given artists and comedians a lot to work with, even before his bid for the highest office in the land. Between his personal antics, his many, many business ventures, and the actual content of his speeches, Trump has made it easy for artists to turn their critical eyes to him to create acerbic, amusing, and frightening art that speaks to the nature of our political system and its loudest candidate. One of the most popular Trump works—and perhaps the most painful to look at—is a painting by 23-year-old artist Illma Gore. The painting features a naked Trump in a power-pose, lips puckered in what is probably a characteristic oversharing of his antediluvian opinions. His right leg is propped up on something we can’t see, and the painting does not do his figure any undue favors—in all areas, and that’s what’s garnered the most attention. But because his facial expressions are so spot-on, the piece creates a dichotomy between Trump as a brand and as an idea and what he is actually like. Despite threats of legal action from the Trump campaign, Gore will auction the piece off so that benefits may go to Safe Place for Youth, an organization that helps homeless youth. In a similar vein, a recently-banned Instagram account posted funny and disturbing images of politicians’ speaking, the entirety of their faces obscured by giant mouths. Trump speaks over a podium, nothing but a gross open mouth and his signature hair; Ted Cruz’s eyes are replaced by simple black dots, and a headshot of Ben Carson shows eyebrows, glasses, and nothing else. The works themselves are pretty amusing (and gross), but they have a unique way of highlighting the candidates’ personality traits. For some of the candidates, the horror of their faces matches that of their commentary. 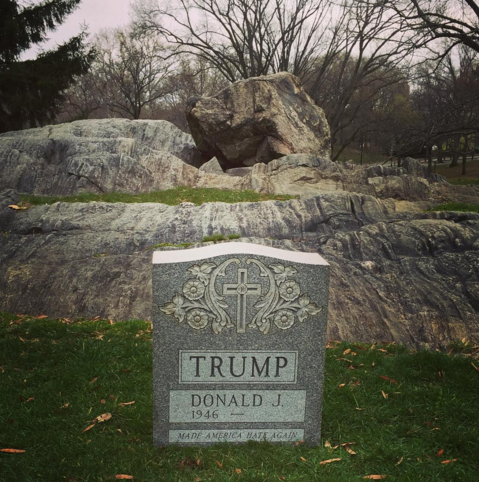 An unknown artist, providing insights darker than those above, created a fake tombstone for Trump that was erected in Central Park. The tombstone features Trump’s name, the dates “1946—,” and the phrase “make America hate again.” The work offers a grave take—if you will—on the possibility of a Trump administration and all that that entails. Check out some of the artworks above! What do you make of them?